VR or Virtual Reality is all the rage these days. Many new Android phones are touting the support of VR to the users. But, not all manufacturers are like that. Some don’t flaunt VR as a feature, and the only way you can check if that phone has VR or not is by using it for a few minutes. We shouldn’t get ahead of ourselves, though. Let us first understand what Virtual Reality is. VR is a 3D generated virtual environment which is generated in front of your eyes via a VR headset. Normally, you will need to wear this VR headset on your head like your wear your glasses so that it can cover your peripheral vision. If the phone you have supports VR, you can then use hundreds of the VR apps available on Play Store or the iTunes store and enjoy the immersive experience that it provides. From the app drawer, open the YouTube app. Search for VR on YouTube and take a look at any video that fancies you. Normally, any of the videos which support virtual reality will show up with a little 360 sign on its thumbnail. If you can’t find something useful, YouTube even has auto-curated a big list of VR videos in a playlist. Tap on any of the videos that you want to play. Wait a few seconds if you have got a crappy internet connection for the video to buffer. Once it starts playing tap on the screen to reveal the VR options. You will see them on the bottom of the screen. For the phone to have full support for 3D video, it should have a gyroscope. You can check the presence of gyroscope on your phone by doing a quick google search of your phone’s name + gsmarena. For, e.g.,., if you want to check for Samsung Galaxy Edge 8 then search Google for Galaxy Edge 8 gsmarena. If you aren’t familiar, GSMArena is a popular website which has the collection of all the phone specifications and other news. In the GSMarena phone page, look at the Features > Sensors section. The gyroscope should be listed if your phone supports it. Sometimes, it is listed as ‘gyro’ which is the same thing. You can also use apps like Sensors Multitool which can list out all the sensors physically present on your phone. There are hundreds of such sensor apps on the Play Store. Once VR support is confirmed, you will need a Virtual Reality headset for your phone from which you will be able to enjoy all the 3D content. There lots of phone VR headsets. 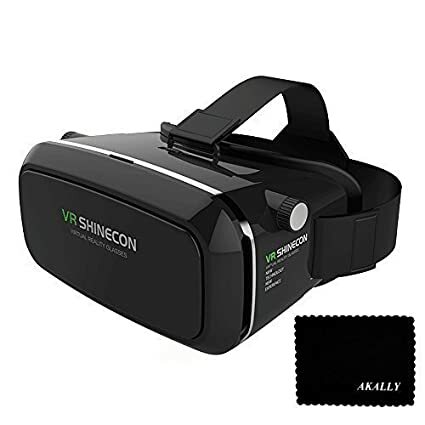 The one which is my favorite is Akally 3D headset. Currently, Apple has kept its mouth shut when it comes to Virtual Reality. Though there are a few apps on the iTunes store for iPhones, there is no confirmation from Apple when the iPhone will officially support this feature. Judging by the history, though, you can be assured that it won’t be soon. This is because Apple takes a lot of time before integrating any new tech into their phones. That’s pretty much all you need to know before buying a phone for enjoying VR content.